AMERICAN INDIAN ADOPTEES: Fake identity? 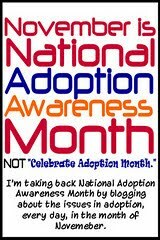 Why would someone think that Adoption erases a child's identity and replaces it with a fake one? Answer: First, we need to define our terms: what do we mean by "identity"? Adoption laws, courts, agencies, and most any and all other agents involved in adoption have a clear interest in rupturing all ties of a child with its progenitors and community, and replacing them with others, as defined by the legal system that they control on all levels. To do this, myths have been built up concerning adoption that, when challenged, place those in power, those in control of the situation—including parents—in a moral dilemma: Even if they agree with what is being said—theoretically, morally, ethically—the circumstances of their lives, the weight of their laws, the preponderance of notions of property in their legal system, as well as the sheer desire to make it so, all result in questions such as this one being asked, as well as in the way the question is framed. In purely legal terms, due to the fact that for the majority of states in the U.S. a child's birth certificate is sealed by the courts, or that for most of us adopted overseas our birth documentation is completely falsified—an avalanche of bogus paperwork in order to shuttle us out of the country—then yes, I think it is fair to say that an adopted child's identity, as defined in this legalistic manner, is not his or her real or true identity. Second, what strikes me particularly strange about having growing up in the United States is the attention given to all aspects of, say, the immigrant experience, and genealogy, and "roots", and ethnicity, such that everyone gets a "hyphen" attached to their country of origin—Polish-American, Italian-American, and in my case, Lebanese-American—except for the true-blue Americans, who are simply "all-American". Given this pride taken in ethnicity, and the obvious hierarchy it establishes in terms of racism, xenophobia, and the like, how is it possible to claim some kind of ethnicity—or other marker of identity—for any child who has not grown up in his or her culture? Eating falafel does not make me "Lebanese", and I still do not claim to be Lebanese now that I'm living here. Why allow such pretension in the States? So in this case as well, I think that my American identity was not "true"—it was instead a series of masks, of affectations—both in terms of my adoptive family, and in terms of my birth country. Third, and as an elaboration of this, I would admit to having an identity, that is made aware to me when I am around people from where I grew up—our speech patterns, our cultural references, our way of seeing things—all are reflective of a time in U.S. history when individual and local areas all had their own manners and mores, quirks, and culture. This of course has now been paved over, suburbanized, and WalMartized. This truly local culture has been replaced by a strange globalized and globalizing hodgepodge of references to superficial trappings of ethnic "style", such that a child's identity is not formed in a local town, say, but from a Mountain Dew commercial instead. Perhaps this is what is meant by "identity" in this question? Fourth and finally, I think there is a hypocrisy within the American view of itself in terms of adoption, in the sense that society and culture in general make reference to blood lines, ancestry, familial ties, and the "nurture" aspect of family relationships, such that we have no problem saying, "he's a chip off the old block" or else, "she takes after her grandmother on her mother's side", or "he's the spitting image of his father." Why should it be, then, that all of a sudden the adopted child is supposed to believe that in his or her case, this doesn't matter? That there is no nature, only nurture? How is it not possible to understand that each and every one of these references might seem slight in and of their own selves, but in the aggregate, they are like being bled to death from a million tiny cuts? The problem here is much deeper than portrayed, because it isn't a bunch of so-called anti-adoption activists that have made suicide the number one cause of death for adopted Korean males in certain adoptive countries, for example. It isn't "bad answers" on this bulletin board that have driven hundreds if not thousands of adopted children from Korea, Taiwan, Lebanon, etc., in progressive waves of generations of dispossessed children who vainly attempt to reverse their exodus and return to their lands of birth, in a useless but necessary attempt to re-establish some vague sense of what we currently refer to as "identity". In 10, 15, and 20 years, it will be the turn of Ukraine, and Russia, and Guatemala, and Ethiopia, and Kenya, and Kazakhstan, and and and...., until such a day, God willing, that the injustice of adoption, and thus this destruction of identity, can be definitively stopped, once and for all. And so you can challenge this "revolt", with a kind of haughtiness that I'm sure is not normally of you, and thereby risk alienating your adopted child, or you can make the huge leap necessary in your worldview in order to attempt to finally understand, instead of simply imposing on him or her, and by extension, on all of us, these myths that we simply wish to point out as being such; in an effort to clear the air; to breathe. To start a process of healing. To know who we are. Cold War Orientalism2, by Christina Klein. Race, Nation, Class3, by Etienne Balibar and Immanuel Wallerstein. The Karma of Brown Folk4, by Vijay Prashad. National Identity5, by Anthony D. Smith. Debate Tactic: There are two sides to this debate. The first is about "claiming" identity; the second is about "assigning" identity. Both are fraught with peril, because the proud claiming of the first maps too well onto the pejorative assigning of the second. By this I mean to say that my "pride" is someone else's "epithet", or tool of destruction. Like much that is currently taken for granted within an acculturation of individualization, the fact is that "identity" is not a function of an individual, but of a community and a society. The first step to break out of this debate is to drive it away from its usual reductiveness. To do so, we need to consider what the prevailing formative norms of language and culture are, and where they come from. So even when I claim to be a "Jersey boy", I need to really say "North Jersey", and then "suburban" (as opposed to rural or urban), etc. To resist along these lines requires us to question any effort to define and delimit us. Checkboxes on government forms, placement in certain lines at the border screening within an airport, replacing an entire culture with a discussion of certain foodstuffs: We must challenge a reductive idea of what identity is. Adoption, in and of itself, is designed to destroy identity. But too often the stunted and crippled shoot that comes from such a pile of rubble is, itself, a Frankensteinian construct. Ironically, it is perhaps in not claiming an identity that we find ourselves. Beirut Diary Online (Formerly New York Diary Online) [Writing, photography, and artwork] Copyright © 1995-2013 Daniel Ibn Zayd [or as otherwise noted], all rights reserved. Academics FINALLY writing about Native Adoptees!